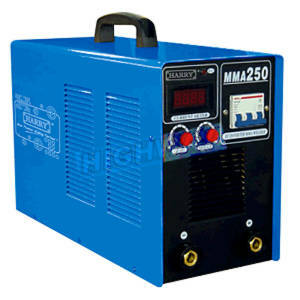 Harry MMA-250 DC Inverter Arc Welding Machine. Stock available at Highway Marketing Sdn. Bhd, Sibu, Sarawak, Highway Marketing Sdn. Bhd. Bintulu Branch, Highway Marketing Sdn. Bhd. Miri Branch, Highway Marketing Sdn. Bhd., Kota Kinabalu Branch, Sabah, Malaysia. • Portable and lightweight for easy relocation. • Adapted to SMAW and simplified TIG welding. • Advanced MOSFET inverter technology and energy saving solution. • Easy arc initiation and over current/voltage protection design.